Two identical, beautifully furnished villas with private swimming pools within easy walking distance of the sea (10 minutes walking slowly), shops and restaurants and just a few minutes drive away from the Fuerteventura Golf Club. The properties each boast 4 bedrooms, 2 bathrooms, 2 lounges and 2 kitchens. The villas stand in an elevated position and the large roof terraces benefit from panoramic views to the sea and the golf course. The properties have been specifically designed on two levels to suit many purposes, as 2 large Holiday villas perfect for large parties or it can be used as four apartments often ideal for several families that like to holiday together, but still like a little privacy and freedom. At the rear of the villas next to the swimming pool there are large patios with barbeque, sun-loungers and table and chairs. The swimming pools are both 7.5 meters long and 3.5 meters wide, and have a graded depth from 1 meter to 1.5. There are also heated pool-side showers. At the front of the properties there are drives, which lead down to the front doors of the lower level. There are also walkways, small gardens and steps, which lead to the front doors for the upper level and small terraces with balustrades and patio doors. The upper levels have spacious open plan rooms, which have leather settees a stainless steel table, chairs and a fully equipped kitchen with microwave. The lounge areas are divided by marble breakfast bars. There are also televisions, videos and CD/mini systems. There are two bedrooms on this floor, one has twin beds and a fitted wardrobe and overlooks the swimming pool. This room also benefits from sea-views. The second bedroom has a double bed and a fitted wardrobe. There is also a bathroom with bath, shower, toilet and hand washbasin. The second lounge/dining room is on the lower level and has two leather settees, a dining table and four, a TV with video and a CD/mini-system. There is a second kitchen which is also fully equipped. 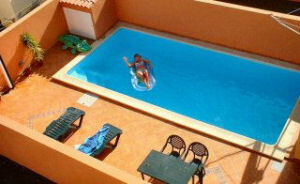 There are a further two bedrooms, both fitted with Canarian Style furniture. One double bedroom, and a further with twin beds and additional bedroom furniture. There is a large bathroom with a shower cubicle. The washing machine is located here and an iron and ironing board are also provided. All rooms throughout each house are fitted with ceiling fans for your comfort. There is also a 40 foot square roof terrace, from where you can see the sea. Caleta is a small friendly town ideal for families and couples. Caleta's beach is a 10 minute walk away and was carefully constructed to avoid currents and is in the shape of a horse shoe. This ensures it is perfectly safe for children of all ages. The centre of Caleta is a 10 minute walk away & has a great choice of restaurants, from fabuolous Steaks to fresh Fish there is also a nice mix of bars & shops. There is large shopping centre 5 minutes away, again with plenty of shops, restaurants and beach areas. Those wanting to be a little more adventurous can go diving, hire jet skis or learn to windsurf at the water centre on the beach. The harbour is home to many yachts, catamarans and boats which provide local trips. the boats also provide a beautiful backdrop in the evenings. Restrictions: Regrettably, we cannot accept bookings from groups of teenagers. There is a £100 discount for the 2nd week when booking a 2 week holiday. Children 5 years and under can come free of charge. The most common days for flying from the UK are Tuesday, Wednesdays and Saturdays. There are flights on Sundays, but they tend to be from either Manchester or Gatwick. In order to book your flights we recommend Flightline www.flightline.co.uk (0800 541541 or 01702 751151) or Airtours direct on 0870 400 1260. 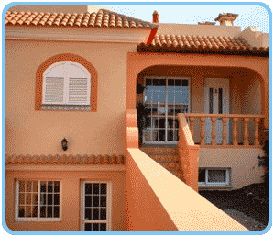 The property management will arrange a free transfer service from the airport for four people.